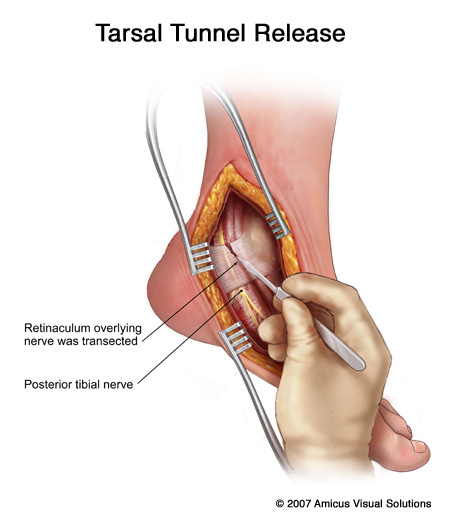 Tarsal tunnel syndrome is an entrapment (compression) neuropathy of the posterior tibial nerve or its branches. This entrapment may occur on the inside of the ankle or down in the heel or arch region. The resulting symptoms may occur in the ankle, rearfoot, midfoot, or forefoot regions. Symptoms may include shooting or radiating pain. Numbness, burning, or tingling sensation may also be present in the ankle, heel, arch, or toe region. These symptoms may be increased with occupational stress or activity to the lower extremity. Diagnosis is suspected whenever any of these symptoms occur along the distribution of the posterior tibial nerve or its branches. Shooting pain may be elicited when the entrapped nerve is percussed (gentle tapping the nerve with your finger). If the diagnosis is strongly considered, it is advisable to obtain nerve conduction velocity studies. A positive test may confirm the diagnosis, but a negative one does not rule it out. An MRI may be necessary to rule out space-occupying lesions (tumor). CAUSES: The posterior tibial nerve and its branches travel through the ankle and heel area in tunnels formed by bones and ligaments. The nerve may become compressed by many surrounding structures. Tight ankle/foot ligaments or fascia are the primary cause. Inflammation of any local structure (tendinitis) may cause a nerve compression. Any space-occupying lesion (tumor or ganglion) may also put pressure on the nerve causing symptoms. Varicose veins may fill in the region causing pressure on the nerve. Any condition which may cause peripheral neuropathy, would make damage or irritation of this nerve more likely. This includes alcoholism, diabetes, and thyroid disorders. It has been shown more recently that hyperpronated feet (flatfoot) may increase pressure in the tarsal tunnel causing nerve compression. Radiculopathy (sciatica) should be ruled out by examining the lower back for any pathology to the L4, L5, and S1 regions. TREATMENT: It is important to ascertain the cause of this nerve entrapment. If a metabolic condition exists, the internist needs to address the patient. If a space-occupying lesion is suspected, an MRI is indicated to visualize the mass. Tendinitis or inflammatory conditions should be treated with rest, medication, physical therapy, or immobilization in a cast. Pronated feet or flat feet need to be stabilized with orthotics. This is especially important in workers who require standing or walking for long periods of time during the day. If treatment fails to provide relief, surgical treatment may be considered. This would consist of releasing any tight fascial (ligamentous) structures over the nerve to allow the nerve to move more freely. The results of surgical decompression are much better if a primary problem is found. If the cause of the entrapment is not found, surgical decompression is less rewarding and the patient needs to be told of this.